This time, the flashpoint was Ms Bedi 's intervention to fill in the government quota rather than let colleges divert these seats to the management quota. 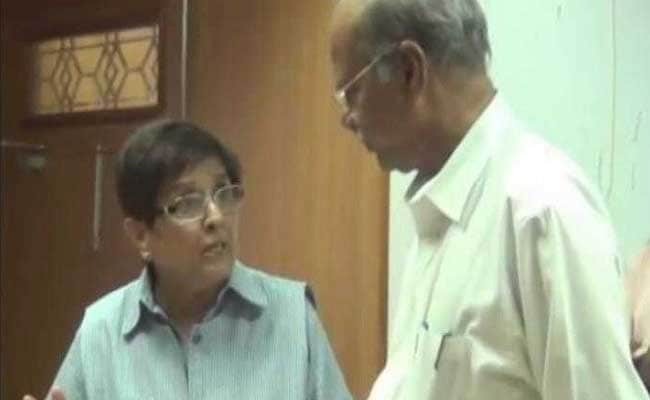 Kiran Bedi pulled up officials of a private college allegedly diverting seats to management quota. PUDUCHERRY: Mounting his sharpest criticism of Puducherry Lt Governor Kiran Bedi, Chief Minister V Narayanasamy on Monday dared Ms Bedi to prove her allegations levelled against lawmakers and officials on social media and WhatsApp groups, declaring that "otherwise you have no right to continue as Lt Governor". Speaking in the Puducherry assembly after lawmakers complained about Ms Bedi's "uncontrolled comments against ministers, officials and legislators", the Chief Minister blamed Raj Niwas of paralysing the elected government. At the heart of the ongoing tussle that started after Ms Bedi's appointment as the Union Territory's Lt Governor is a dispute over who gets the first and last word in running the affairs of the union territory: Chief Minister or the Lt Governor. Ms Bedi had made it clear right at the beginning of her tenure that she didn't intend to be a rubber stamp and pointed to the rules that give her a broad mandate. In January, she overturned the Chief Minister's ban on officials using WhatsApp. In April, she demanded action against Chief Secretary Manoj Parida's "condemnable conduct" of removing Puducherry municipal commissioner on Assembly Speaker V Vaithilingam's order. In a video of her surprise visit, Ms Bedi is seen losing her cool with officials of a medical college after students complained they weren't getting admission. "Do you want any other order? Then the other order will have to come from the Government of India," she told the official in-charge of admissions. He nodded, but added that he would need to discuss before announcing the names of admitted students. "There is no need for discussion anymore," she said, to cheers from the candidates. Her intervention, she said, brought back 71 seats, a claim questioned by the Chief Minister. "Lieutenant Governor of Puducherry is acting beyond the powers vested in her. Therefore, it is high time that I have to open my mouth because otherwise the state government is being affected. I will not tolerate this," he said. "He wants a Lieutenant Governor who is just an onlooker and passes time and enjoys benefits of expensive establishment called Raj Nivas without meeting people or questioning officers and would do what he tells even in writing," Ms Bedi responded in a message to a WhatsApp group comprising journalists and other professionals.